Greece is on the edge of a deadline to pay 1.6 billion euros (about $1.8 billion) back to the International Monetary Fund, and a crowdfunding campaign called “Greek Bailout Fund” wants to help. The campaign, set up on the fund-raising website Indiegogo, has raised more than €250,000 in two days — not an insignificant amount of money, but also far from the campaign’s goal of €1.6 billion. The campaign was started by an Indiegogo user named Thom Feeney, who identifies himself as a 29-year-old working in a shoe shop in Britain. Crowdfunding, or raising money online from many individuals who each give small amounts, has financed a number of high-profile projects in recent years. Some campaigns seem to be intentionally wacky — like the one in 2011 that raised $67,000 to pay for a RoboCop statue in Detroit — while others seek to make the world a better place. But a crowdfunding campaign to bail out a country seems to be a first, according to Anindya Ghose, a professor of information technology and marketing at New York University’s Stern School of Business, who has been researching crowdfunding for the past six years. “It’s very unique,” Mr. Ghose wrote in an email. In at least one way, though, the campaign and the reaction to the crisis in Greece fit into what Mr. Ghose has seen in his research: Altruism is a key motivating factor inspiring people to donate. 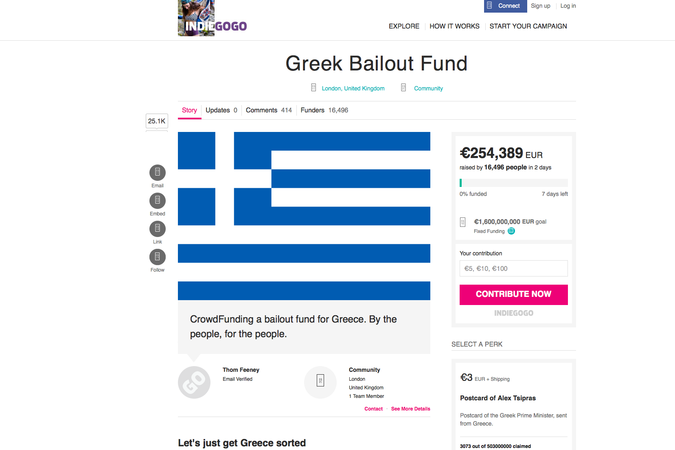 Supporters are using the hashtag #crowdfundgreece to spread the word on Twitter. Some have pondered whether the campaign will raise the €1.6 billion. The expert opinion: Absolutely not. And even if it did, the €1.6 billion due Tuesday is a tiny fraction of Greece’s total debt, which Reuters estimated at €242.8 billion. Another payment, €3.5 billion to the European Central Bank, is due in July. No harm in trying, though.